Looking back, 2018, my fourth year as Fort Greene Park Director, was an incredible year of growth and expansion. Much of what we accomplished would not have been possible without the neighbors who care for and support the park. A series of small miracles have to be performed on a daily basis to keep the park in great shape. Equipment breaks, staff get relocated, and supplies run out at crucial moments. In 2018, a 40% increase in funding for park supplies and equipment from the Fort Greene Park Conservancy helped improve the visitor experience in many ways. This year will go down as one that finally established a baseline for consistent and quality park care. An appreciation of that baseline is essential. Now that the bar has been raised, we need your support to keep it there. We were fortunate that new funding through the Parks Department’s Zone Management Program in Spring 2018 brought more resources for personnel and equipment than ever before. This initiative allowed us to build a dedicated team of more full-time workers and adopt best practices for urban park maintenance pioneered by the leaders in the field at Central Park. We are lucky to now have a team dedicated to Fort Greene Park for maintenance and enforcement. Most NYC parks are serviced by mobile crews that briefly visit a dozen or more properties in a single day. Actually assigning a worker to Fort Greene Park builds familiarity with local conditions and relationships with our park community. I hope you have the opportunity to personally meet the new staff members who serve your park. The Conservancy’s e-newsletter frequently runs an “In the Zone” profile highlighting park staff. You can always call 311 to report issues, but it’s easier to just flag down a worker in a utility cart when looking for an update on park news or to report a leaking drinking fountain. As our park gets busier and busier from our growing neighborhood, the addition of a full-time enforcement detail helps keep the peace between user groups. Gardener Maxine Web stopped to smell the coneflowers at the South Portland entrance garden, winner of the NYC Parks August Garden of the Month award. Beyond the nimble and friendly nature of a team dedicated to our park, we are now able to control more aspects of park maintenance and elevate the level of service than was previously possible. We now take for granted that garbage cans will be emptied daily and the grass will be mowed regularly. But up until a few years ago, we had no ability to cut our own grass and instead waited for a crew to come every few weeks. This year, we improved the lawns with weekly mowing and bi-annual aeration and re-seeding. Extra staff have allowed us to open and close lawns each day to ensure they rest after wet weather and bounce back from constant foot and paw traffic. Passive lawns provided a lush carpet for relaxation and weekly yoga and tai chi programs. Additional equipment enabled us to control snow plowing and ensure most pathways were passable within a couple of hours after the snow settled. Areas like the Monument Plaza had never been plowed before because a pick-up truck with a plow couldn’t squeeze through the entries. A lumbering garbage truck traversing our pathways, damaging the asphalt, lawns, and compromising public safety was once the norm. Now, our new electric utility carts quietly zip about at night to take out garbage and recyclables to one of two perimeter holding pens for collection. This first-ever night shift ensured morning park users saw less litter and fewer overflowing receptacles. The night shift also kept bathrooms open two hours later than previous summers. Navigating our hilly terrain can be hard work. 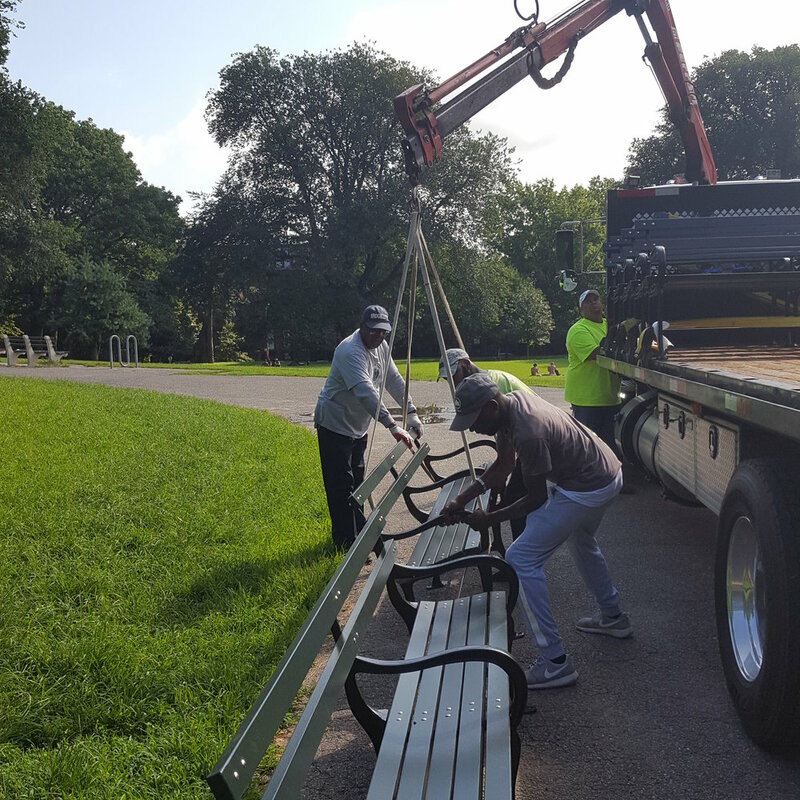 The Fort Greene Park Conservancy installed new benches to allow for rest and contemplation. Our 2018 operations makeover coincided with the Community Heroes NYC photography installation along the Brooklyn Hospital fenceline that celebrates everyday residents who organize and generously give time and talent for the good of the park and neighborhood. Many of the Heroes stepped up without official titles at a time when resources from the City proved scarce. On one banner, you’ll meet the recently deceased Jamie Ramirez, who lived in Bushwick and walked three miles seven days a week, for nearly 20 years, to clean the St. Edwards Street playground in a mostly volunteer capacity. Another Hero profiled, Kath Hansen, organized dog owners in the late 1990s to win off-leash privileges for the park. This park was once a place to be avoided at night—off-leash hours and the resolute nighttime presence of neighbors and their pets help ensure there are always eyes on the park. Another banner celebrates Ruth Goldstein, the founder of the Fort Greene Park Conservancy, which celebrated its 20th year in 2018. What started as a few neighbors planting daffodil bulbs is now a robust non-profit organization that produces over 180 free programs and invests thousands of dollars in the park’s maintenance annually. The Community Heroes photography exhibit draws visitors to the western edge of the park and celebrates the contributions of longtime residents to the park and neighborhood. Community Heroes celebrates the neighbors that have taken it upon themselves to help sustain the Park, and serves as a reminder that the Parks Department can’t do it alone. If the last few decades are any indication, parks funding is often the first to get cut during an economic downturn. This year I was thrilled that our community continued to fill dog waste bag dispensers with bags from home even though the City now purchases official bags. The Fort Greene Park Conservancy funded projects to restore and upgrade areas of poor drainage, outfitted a new office trailer to provide a welcoming home for the additional staff, supported the beautification of entry gardens with plant materials and volunteers, and funded dozens of last minute purchases to keep our new equipment in good repair. This support kept the park in working order. Fort Greene Park has relied on both public investment and the contributions of our community to create today’s impressive new standard—that same partnership will help sustain it through the exciting era ahead. Many heroes and many miracles in 2018 kept the park clean, green, and safe and complemented the additional resources from the City. Several times I paused to take a breather from the hustle of park operations to appreciate a freshly cut lawn, new recycling receptacles, or the warbler songbirds chasing insects across new native plantings. I hope you noticed the changes as well. Please send us your comments and suggestions and if you’d like to be put in touch with any of the organizations mentioned above to see how you can help more directly, please let us know. We can’t take for granted all we have accomplished in partnership. See you in the park in 2019. In 2018 we remain ever-grateful for David’s steadfast leadership and passion for our neighborhood park and the people it serves. We’re honored to be able to support him and his team year-round in keeping the park clean, green, and joyful for all. To help ensure that the new standard of excellence in Fort Greene Park is maintained, become a member of the Fort Greene Park Conservancy today.